JJC LH-73BI's filter access window equipped EF-S17-85mm F4-5.6 IS USM, EF -S18-135mm F3.5-5.6 IS, EF-S18- 135mm is F3.5-5.6 iS STM dedicated lens hood. 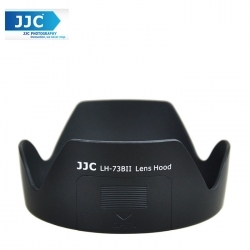 I open the filter access window of the hood top, such as CPL filter, you can easily access to the necessary filter from time to time effect adjustment. [Filter access window] The most significant feature of this food is to filter access window has been equipped. By removing the opening and closing parts as shown in the figure, you can to facilitate the rotation adjustment of filter effect can quickly access to the filter.